It’s Tradeshow Season! Will we be seeing you at one of them? The Wilderness Reserve once again! Since our last publication, we have had a fantastic holiday season with friends and family, a few more late-season hunts, and literally a ton of other work being done, on and “off” the property. When we refer to the work that is “off” the property, it is literally the most important work that we do throughout the year. In order to ensure that our entire fall hunting season is booked full of new and returning clients alike, not only do we need to be on our phones and computers all the time, but we personally want to meet and see everyone in-person. The cold winter months of 2019 means only one thing, and that is “Trade-Show Season”, where we get to travel the country and meet and see all the fellow sportsmen and sportswomen in the business, but more importantly, the phenomenal families and hunters that would like to come hunt with us up here in “Da Northwoods”, if they haven’t already. Obviously, not everyone books a hunt right away, but that never takes away from the excitement of meeting new people in our booth and hearing all their wonderful stories from the outdoor world. Our fantastic management team of Forrest and Lisa Pike, have launched our “Trade-Show Season” into a whole new world by heading out to the Safari Club International Convention in Reno, Nevada on January 9th-12th. 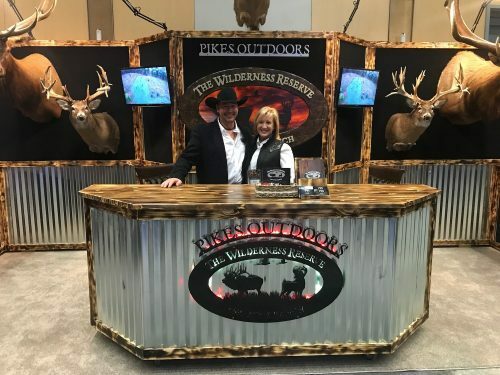 With their experience in this business and literally amongst the best competition at any show this this nation, they were able to book several Elk and Whitetail hunts for this upcoming fall, and this is just the beginning! On the way out to Reno, this dynamic duo stopped out in Denver, Colorado, where they did a television interview on a sports network and were able to share what we have to offer at The Wilderness Reserve, up here in northern Wisconsin and Michigan. On top of that, The Wilderness Reserve, helped to sponsor “The Extreme Rodeo Challenge” in Loveland, Colorado on New Years Eve, which was listed by USA Today at the number 8 event to do on New Years in the country!This event also netted the Wilderness Reserve another hunt!! The traveling road has only just begun though, as we will be attending the “National Wild Turkey Federation Convention and Sport-Show” in Nashville, Tennessee, on February 13th-17th. We make the journey home, and then make it to “The Safari Club International Sport-Show” in Lake Geneva, WI on February 22nd-24th, immediately followed by “The Dixie Deer Classic” in Raleigh, North Carolina on March 1st-3rd. The end of March brings us closer to home again at “The Wisconsin Deer and Turkey Expo” in Madison, WI on March 29th-31st, which happens to bring us a little closer to our hearts, having so many friends, family, and fellow hunters in the area, visiting us there at our booth. Please believe that it’s not always about booking a hunt all the time, but just enjoying great company and fantastic stories that we get to share about the outdoors! We have so much more to share about upcoming shows in April and beyond, but that will have to wait for the next publication, as well as our progress here “on-campus”. We have succeeded in harvesting 100% of the animals that we have wanted with our clients for almost three years now, and that comes from a lot of intense herd care and management. Every year, with our growing herds, our seasons are obviously becoming more exciting and literally “breath-taking”. We would love to see everyone at some of the shows so we could show you some of our pictures, and just generally share the same enthusiasm with you that we have here at The Wilderness Reserve on an everyday basis! https://thewildernessreserve.com/wp-content/uploads/IMG_0322.jpg 1125 1500 IMT-Webmaster https://thewildernessreserve.com/wp-content/uploads/TWR-Logo-Large.png IMT-Webmaster2019-02-19 13:31:102019-02-19 13:33:02It's Tradeshow Season! Will we be seeing you at one of them? A Youth Hunt offers an adult and child hunting experience that will build family memories deep rooted in tradition. We will provide the proper safety instruction and an experienced guide. With you by their side, your child will cherish this experience for several years. The Wilderness Reserve takes pride in the management of their whitetail deer herd. At times, we offer the opportunity to harvest management buck hunts by youth hunters. This provides a great educational opportunity for a young, inexperienced hunter and allows us to accomplish our herd management goals. For our 2017 season which runs Aug 15th – Dec 15th, we have 5 youth hunts available. By providing safety instruction and experienced guides, The Wilderness Reserve strives to create a family friendly hunting environment that keeps everyone involved, safe, and comfortable. We hope to see you in 2017 and for many years to come! Please fill out the form below if you are interested in our Youth Hunt Package. Please fill out and submit this form if you are interested in our Youth Hunt Package. If you are traveling to Northern Wisconsin or Upper Michigan for a whitetail deer hunt, our experienced hunting guides can make all of the difference! You need to know the lay of the land and the habits of the area’s animals, and that’s difficult if you only have a few days to hunt. Luckily for you, The Wilderness Reserve is building a team of hunting professionals to ensure that your reserve experience is as rewarding and successful as possible. One such Wilderness team member is Tom Nicholson of Uncle Tom’s Outfitters. Tom has been hunting and trapping for his whole life, starting at a young age as part of his family hunting tradition. He continued the tradition with his own four children, with the youngest joining him in the hunting stand at the age of 4. His kids inherited Tom’s passion, and have continued in his footsteps. Given his experience and success in the outdoor sport, he began Uncle Tom’s Guide Service & Fly Tying in 1981 to share his knowledge and passion with others. He now runs Uncle Tom’s Outfitters in Portage, Wisconsin, with the help of his wife and family. Uncle Tom’s Outfitters covers all of your hunting and fishing gear needs with the family’s gun and archery expertise. Whether you are looking to buy or need repairs, Uncle Tom’s Outfitters works with guns, archery, and fishing rods to help get you ready to hit the woods or the waters. Tom hosts guided hunts around Wisconsin for turkey, bear, and whitetail deer. He is also a great fishing and bow fishing guide, as well as an instructor for hunting, bow hunting and trapping safety and education classes in Wisconsin. Tom’s passion for hunting runs so deep that he helps to make sure that anyone can enjoy the wonders of the hunt, by coordinating annual hunts for disabled hunters and youth, and educates women and children in gun handling and hunting. He’s proud to be involved with such wonderful organizations as United Foundation for Disabled Archers, National Wild Turkey Federation Wheelin’ Sportsmen and the NWTF Women in the Outdoors. As a whitetail deer hunting guide at The Wilderness Reserve, Tom looks forward to guiding hunts on the unique property. 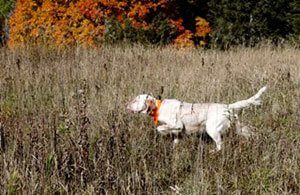 He explains that reserve hunting, although challenging, provides a unique experience attainable for hunters of all ages and abilities. And you couldn’t ask for a more beautiful and secluded location for a whitetail hunt! To learn more about Tom Nicholson and Uncle Tom’s Outfitters, visit the website or find them on Facebook! The Wilderness Reserve offers a quality whitetail deer hunting experience in the Northwoods. 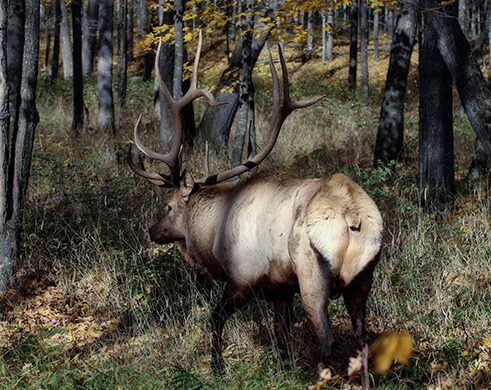 Located in the beautiful forests of Northern Wisconsin and Upper Michigan, this historic reserve includes 5,500 acres of quality managed habitat brimming with whitetail deer, Rocky Mountain elk, and a variety of Northwoods wildlife. With our experienced hunting guides and unique property, you are sure to enjoy a successful hunt, whether it is your first or hundredth hunt. All-inclusive hunt packages include a 4 day, 3 night stay in one of our secluded cabin rentals, each located on its own private lake. Bringing the family along for your hunting vacation? No problem! The Wilderness Reserve encourages multi-generational hunts, and the vast property offers great outdoor experiences for all ages. Take a row around the lake and enjoy the scenery or try your hand at shooting sporting clays on our professionally designed course. You may come for the deer, but you will love every moment! Check Out a Guided Whitetail Hunt at The Wilderness Reserve Today! We have all been there – you are geared up and ready to capture that whitetail trophy you have been waiting for all year long. You finally spot the perfect buck and, oops, accidentally step on a twig and alert him to your presence. As the whitetail buck bounds off, you are left hitting yourself on the forehead for missing a great opportunity. The fact is that as humans, we can’t help but make noises that do not blend well into a natural setting or a whitetail’s habitat. And as hunters, we are up against hearing skills that are far superior to our own. Deer are blessed with incredible ears that can hear a small noise at least a quarter of a mile away. The funnel shaped sensitive area inside their ear even allows the deer to distinguish fairly accurately how far away the sound was made. How can you beat super hearing like that? Whitetail deer, and Rocky Mountain elk and other members of the deer family, can turn their ears 180 degrees to pinpoint where a noise came from. If you have ever observed these wondrous creatures in their natural habitat, you will see them aiming their ears in different directions. Often, they are listening for a fawn or the rest of their herd, but sometimes it is a sign that they are aware of danger. When a whitetail deer hears a noise, it will come instantly alert and point its ears in that direction. Then it holds as still as a statue while utilizing its other senses, like sight and smell, to determine if there is a threat. It may seem like a buck is looking directly at you, but if his ears are pointed a different direction, you are probably safe. So what can you do to be more agile and stealthy when hunting that trophy buck? Well, it’s impossible to be completely silent while on the move, and if you prefer stalking your buck to sitting in a stand, you have to accept that fact. Nonetheless, we have to try, right? That’s why The Wilderness Reserve has put together some tips to help you master the quiet hunt. ​The right footwear goes a long way – go for something with a softer sole that will mask any noises and allow you to tread lightly. Dress appropriately – wool or soft cotton clothing won’t make a strange sound when brushing against tree branches or other pieces of clothing. Silence all electronics before heading out for your hunt; you don’t want to scare away your trophy buck by a chirping cell phone! Time your hunt to work with Mother Nature and take advantage of when the forest floor is softer, and thus quieter, like when the leaves are covered in an early morning dew. Rainy days can mask any small noises that you do make, helping to provide a sound barrier between you and your trophy buck. If you listen to the sounds of nature around you, you can time your movements as to mask them behind the call of a bird or a clap of thunder. Know your terrain – what type of ground cover are you likely to encounter? What possible path would offer the quietest footing. Whenever possible, watch for moss, solid rock or grassy spots to step. Move on the balls of your feet, minimizing the area that your foot makes contact with potential noise makers. Keep your weight on your back foot with your front foot testing the ground ahead. Clear your path of twigs and branches with a good walking stick. Walk in a step-step-pause pattern that mimics the natural footsteps of the wildlife around you. Pause at random intervals, as an animal would. Constantly moving forward can give you away and it’s worth your time to move slower and pause to blend in. Discover Trophy Whitetail Deer Hunting at The Wilderness Reserve of Wisconsin! The Wilderness Reserve of Wisconsin is THE Whitetail deer hunting destination of Northern Wisconsin and Upper Michigan! Capture the trophy you have been waiting for while enjoying the beauty of Northwoods nature on a 5,500 acre reserve. Stay in a secluded cabin on its own private lake and wake up more rested than you have ever been in your life. Plan a trip with your favorite hunting buddies, come with the family, or book a solo hunt – you will love the results! Book your Wisconsin Whitetail Deer Hunt Today!